In 1731 John Grundy Sr, a notable surveyor and hydraulic engineer, arrived in Spalding to survey the area for local landowner the second Duke of Buccleuch. The following year the Duke became patron of the Spalding Gentlemen’s Society (SGS). Grundy became a member of the Society in 1731 and was commissioned by the SGS to produce a map of Spalding. 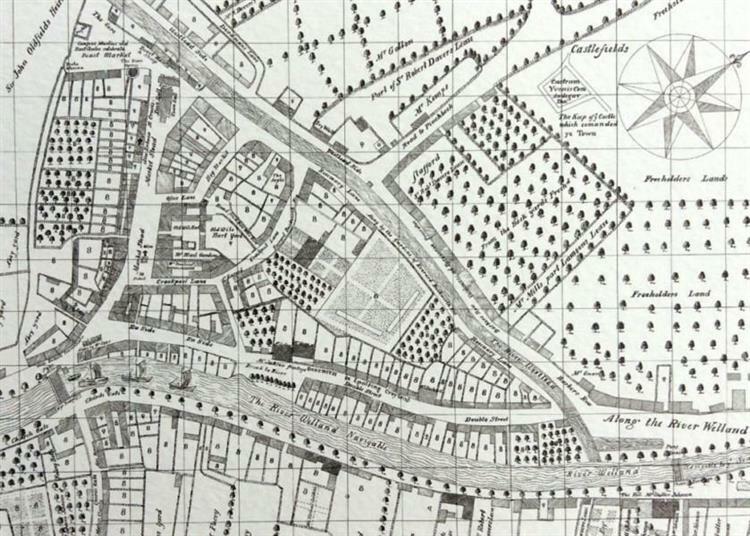 This map of 1732 remains to this day one of the most important historical documents relating to the history of the town. 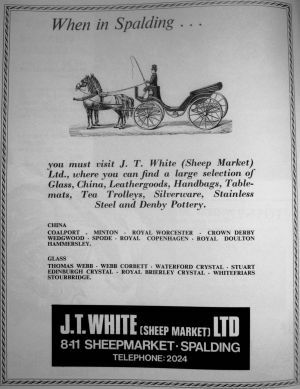 The built-up area of Spalding in the early 18th century was enclosed within a triangle bounded by the River Welland to the east, the street we now know as Market Square and Hall Place to the west, and to the north by another river known as the Westlode, now commemorated in the name of Westlode Street. The area outside this triangle according to Grundy’s map was mostly given over to orchards and gardens. The term ‘lode’ indicates that the Westlode was an artificial drainage channel; it flowed from a junction with the River Glen at Pinchbeck Bars, alongside Dozens Bank to Pode Hole, then followed the route of the present-day Bourne Road, Winsover Road, New Road and Westlode Street to meet with the Welland near the west end of Albion Street. Some authorities believe that its origins go back to Roman times; it is certainly of some antiquity. The Westlode was no mere drainage ditch, however. Various accounts state that it was navigable along its whole length, and barges plied their trade between the Glen and the Welland, where they could transfer their goods to larger boats to take advantage of the latter’s outfall to the sea. The junction between the two waterways was controlled by a sluice gate. Grundy’s map shows what appears to be a landing stage in the area which now forms the Sheep Market, presumably for foot passengers and produce destined for the town itself, particularly corn. According to Old Robin Harmstone, whose memories are recorded in the 1846 book ‘Remarkable Events connected with the History of Spalding,’ no less than five bridges crossed the Westlode in the course of its passage through Spalding. It may not, however, have been the most fragrant of waterways; a footpath along the south bank is recorded on the map as Rosemary Lane, apparently an ironic reference to the noxious odours rising from its polluted waters, although Old Robin remarks that the water was ‘always fresh and pure’, perhaps a piece of selective memory. By the end of the 18th century, the Westlode’s days as a waterway were drawing to an end. Early in the next century much of it was filled in, often with silt dredged from the Welland, and the urban section covered over. 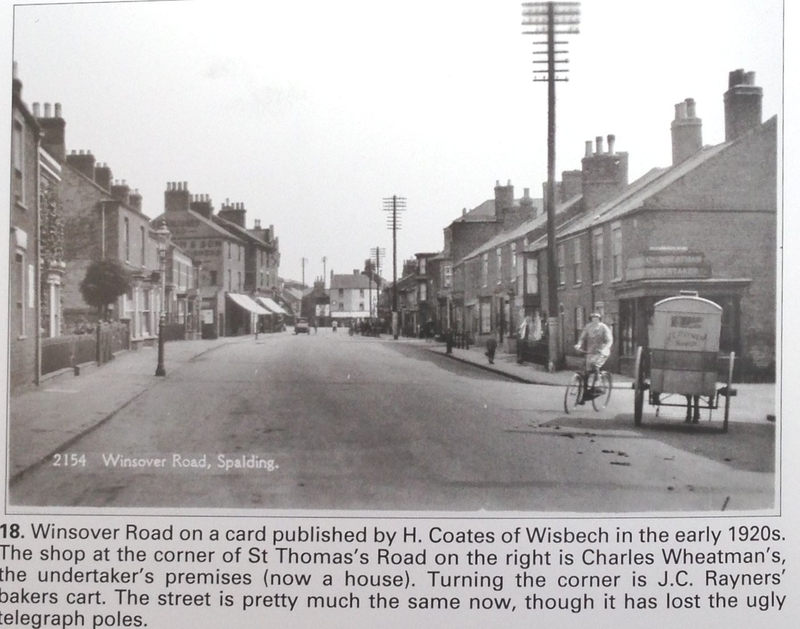 The sluice gates were removed, and in 1822 a turnpike road was opened between Spalding and Bourne. The end of the Westlode removed a barrier to the northward expansion of Spalding, and development soon began in the direction of Pinchbeck and Boston. A small section can still be seen today, however, albeit much diminished; the Ordnance Survey 1:50,000 map identifies a drain running south of Bourne Road between Pode Hole and Monk’s House as ‘Westlode Drain’. Grundy’s map also features drawings of buildings in and around Spalding, suggested to him by members of the SGS, some of which no longer exist. 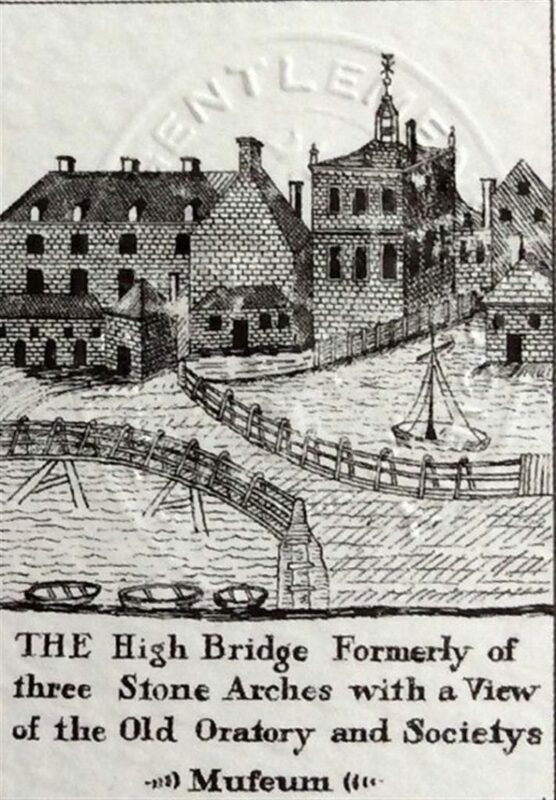 These include the old town hall, which stood in what is now Hall Place, and the Chain Bridge, which opened for the passage of seagoing ships, just east of the junction between the Westlode and Welland. 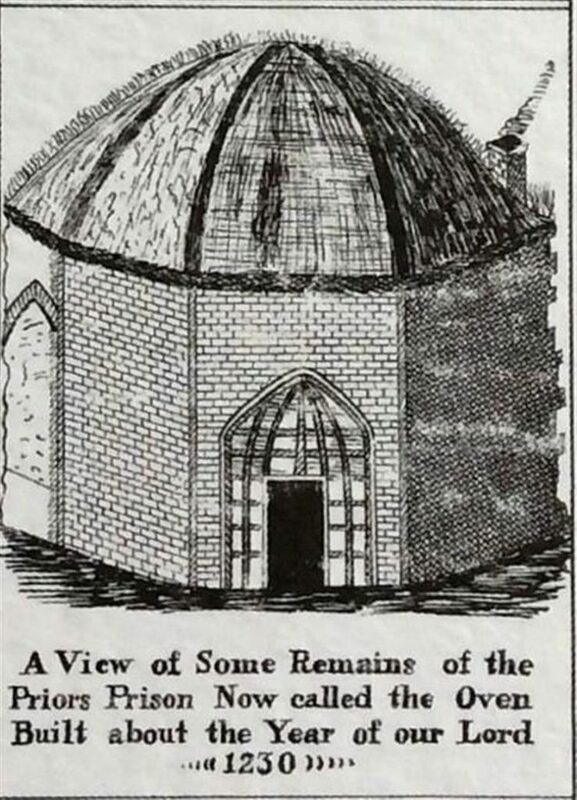 Some remains of the Prior’s prison still stand, of course, as the Prior’s Oven micro-pub.